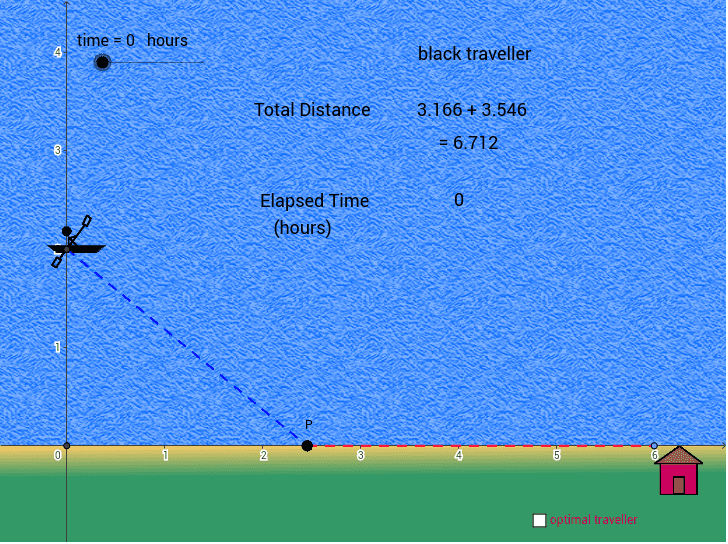 Problem: Maya is 2 km offshore on a boat and wishes to reach a coastal village which is 6 km down the straight shoreline from the point on the shore nearest to the boat. She can row at 2 km/hour and run 5 km/hour. Where should she land her boat to reach the village in the least amount of time? To get an idea of what this question is asking drag the point P along the shoreline to see how the total time taken to complete the trip changes. If you turn on the "optimal traveller" you will see this red traveller has found the optimal place to land on the shore. Try letting the two travellers race to see that red is indeed the optimal traveller. Can you find the exact coordinate of this optimal spot that the red traveller has found? This is precisely what the problem, as stated above, is asking for.